Twelve years ago, Geoffrey Boycott received the diagnosis that tore his world apart: he had cancer of the tongue. Having faced down the fastest bowlers during his career as one of England’s greatest-ever batsmen, he now had to take on an even more daunting foe. In this fascinating new book, his first autobiographical work for more than 15 years, Boycott not only relives his terrifying battle with cancer but also opens up about the personal side of his life as never before, writing movingly about his long-time love Rachael, and their daughter Emma. He talks about his many other interests and friendships beyond cricket, with a moving chapter on Brian Clough as well as revealing some surprising enthusiasms: Boycott and Katy Perry? But Boycott has devoted his life to cricket, and his insights on the game, its players and those who write and talk about it are never less than frank, revealing, entertaining and very honest. Following the death of Tony Greig, Boycott returns to the subject of the Packer ‘revolution’ to ask how much it really changed things, and he assesses the modern generation of players: how does he rate England’s prolific captain Alastair Cook? And is Kevin Pietersen a batting genius or a player who has frittered away his talent? His opinions come with the authority of someone with profound knowledge of and love for the sport. 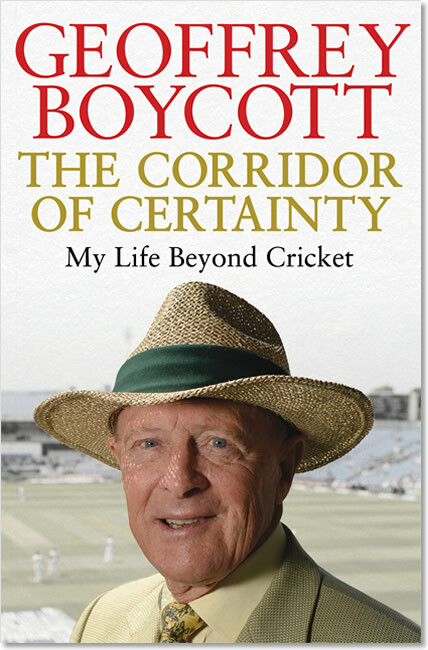 In commentary, he refers to the ‘corridor of uncertainty’ for a batsman – but with Geoffrey Boycott there is never any room for that, which is why this book is such a compelling and entertaining read.